Blest Company manufactures machines that recycle plastic into oil. 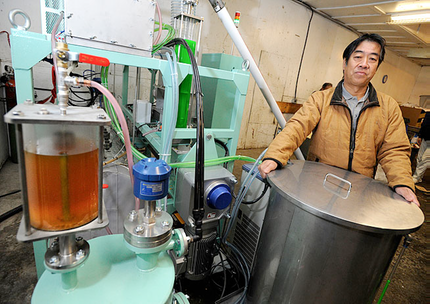 This machine produces unrefined oil, composed of kerosene, diesel, gasoline, and heavy oils. The gas resulting from the process is sent into a gas filter which breaks it down into H20 and CO2. The oil resulting from the first machine is unrefined. Blest also manufactures machines to refine the oil, the BOR-20 and BOR-50, so that it can be used in other applications. was in Whitehorse this week to install one of his machines at P&M Recycling for a year-long test project. What if we could turn all the plastic in our landfills into oil to heat our homes and fuel our vehicles? If that sounds like a pipe dream, it’s not. It’s happening right here, right now, in the Yukon. A machine invented in Japan has been installed at P&M Recycling in Whitehorse. It can chew through 240 kilograms of plastic every day and produce enough oil to continuously heat about 70 Yukon homes. It looks like a mad scientist’s workshop and takes over an area roughly the size of a pool table at the recycling plant’s warehouse. Plastic that has been cut into coarse granules is fed into a trough. It then moves through various tubes and chambers. Through the process, the plastic is heated into a liquid and then into a gas, and then cooled. The machine can process about 10 kilograms of plastic and produce about 10 litres of oil every hour, and can run continuously around the clock. The only other byproducts include a tiny bit of carbon residue, carbon dioxide and water vapour. The carbon dioxide emitted is equivalent to about four humans breathing normally. Just about any plastic can be fed into the machine. Paper labels and a little dirt won’t hurt it, but the material should be relatively dry. The electricity input costs an estimate 14 cents per litre of fuel produced. The oil that comes out is a blend of gasoline, diesel, kerosene, and some heavy oils. It can be fed directly into an oil furnace, or could be processed further into something that could go straight into a diesel car. The idea behind the machine is simple. When Yukon innovator Andy Lera first heard about it a year and a half ago, he thought it might be too good to be true. Lera experimented with his own small-scale plastic processor, which he admits was not particularly efficient or safe. But it proved that the concept works, that you can in fact turn plastic into oil. With a little more research, he discovered how much we need a technology like this in the Yukon. In some instances farmland has been re-purposed as a sorting area for plastics, said Lera. “The plastics that they cannot process, because it’s got a paper label glued onto it or something, they’re lighting it on fire and burning in an open pile. And that’s going into the global atmosphere, it’s not just local over there. Lera’s idea has come to life thanks to funding from Cold Climate Innovation at the Yukon Research Centre and the Canadian Northern Economic Development Agency, in partnership with P&M Recycling. They bought the machine for about $200,000 through distributor E-N-ergy, and modified it to function in a cold climate. For example, cooling in the system is done with antifreeze instead of water. Most of the plastic we throw away is essentially worthless. Recycling centres in the south will pay for the number ones and number twos, which comprise a lot of beverage containers and related products. Polyvinyl chloride, the number three plastic, is toxic and quite nasty to deal with. No one will pay for numbers four through seven, which could make them an untapped gold mine. “This plastic is worth zero as a plastic. What is it worth as a diesel, as a synthetic diesel? It’s probably worth way more than zero,” said Stephen Mooney, director of Cold Climate Innovation. The goal of this pilot project is to give P&M Recycling the ability to process plastics onsite, rather than sorting it and trucking it south, while producing enough energy to heat the 600-square-foot recycling centre. Pat McInroy, the owner of the recycling centre, estimates he will save $18,000 in annual heating costs, plus labour costs for sorting and baling the plastic, and trucking costs. The machine should produce much more oil than is needed to heat the warehouse, and the excess could be sold. The project will help determine the exact cost of turning plastic into oil, and how much it’s worth in the end. The technology has been sold to commercial operations, municipalities and non-profits around the world, but this specific design is the first in the world. Previous models were larger, less efficient and less user-friendly. People from Alaska and elsewhere have expressed an interest in coming to Whitehorse to check out how the machine works. “There’s potentially a million litres of oil going into our landfill a year. Why not take that and heat some homes?” asked Mooney.